PH: Can you outline what the Minafin Group is and how it differs from Minakem? 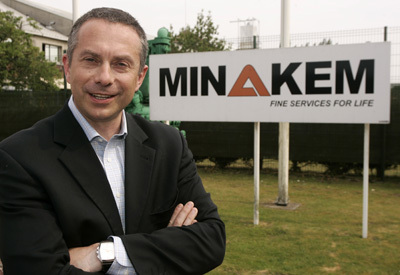 PH: You recently began adding capacity to the Minakem site at Dunkirk in France, adding a total of about 54 m3 of capacity and also upgrading existing assets. What was the thinking behind this? Gauchet: In the past, we grew mainly by acquisition, now we have six industrial sites and are carrying out a lot of capital expenditure because we are focusing more on internal growth. Of course, we are still interested in acquisitions but we want to develop what we have already, because we have a critical size: about €200 million/year in sales. Under our ‘Jump 21’ plan, we aim to be one of the top ten companies in the CMO sector by 2021 in terms of customer references. From that perspective, we have been attracted a lot of new projects and new customers, and therefore we need capacity. Therefore, we have invested in these new lines and in parallel putting a lot of effort and resources into supporting activities like analyticals. PH: What other investments have there been? Gauchet: Last year, we also invested in chromatography capabilities at Louvain-la-Neuve in Belgium, for example, as well as at PennAkem for a cosmetic ingredient. We have also invested in people and reorganised our pharma assets to ensure we have one common face to the pharma customer, which is Minakem. PH: Are there any technology gaps in your portfolio you are looking to plug? PH: Do you see the current growth in the market continuing indefinitely? Gauchet: Business is good for us – the company, our reputation and the market are all growing We are in a business that has cycles but I think this cycle will continue for quite some years, because the innovation in the pharmaceutical industry has been strong. There has been an East-to-West trend in terms of manufacturing, consumption is growing in the market and certain technologies are proving attractive. Companies that are able to mix those technologies with service could still have quite some years of growth ahead. PH: How has DCAT Week been for you? Gauchet: Busy! There was some time wasted because of the snow on Wednesday but we had some really good meetings.